Soldier Field was designed in 1919 and opened on October 9, 1924, as Municipal Grant Park Stadium. The name was changed to Soldier Field on November 11, 1925, as a memorial to U.S. soldiers who had died in combat. In its earliest configuration, Soldier Field was capable of seating 74,280 spectators and was in the shape of a U. Additional seating could be added along the interior field, upper promenades and on the large, open field and terrace beyond the north end zone, bringing the seating capacity to over 100,000. Soldier Field was used as a site for many sporting events and exhibitions. The first football game played on its field was November 22, 1924 as a capacity crowd watched Notre Dame edge Northwestern, 13-6. It hosted the first boxing event which drew a gate of over $2.5 million (Dempsey-Tunney, 1927), the first ski meet held in a stadium and the all-time largest football crowd (123,000). The stadium was formally dedicated on November 27, 1927 with Army battling Navy at its 29th annual game ending in a 21-21 tie. 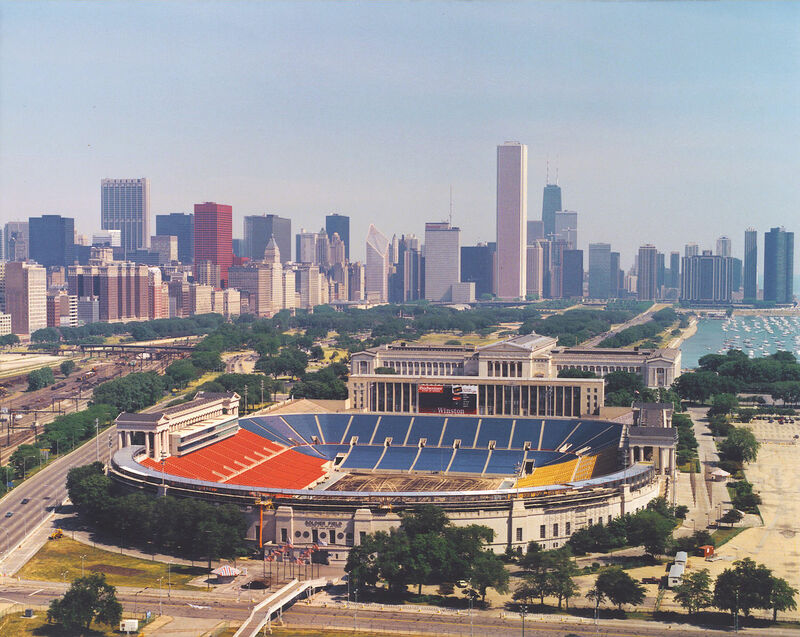 In 2000, Chicago Mayor Richard M. Daley announced that Soldier Field would be completely renovated and expanded as part of Chicago’s Lakefront Improvement Plan. As part of a nearly $400 million reconstruction project, the majority of Soldier Field was demolished with the exception of the exterior. The new Soldier Field broke ground on January 19, 2002. In just 20 months, the shortest construction time for a modern day stadium on record, the Project was completed. It included the restoration of the existing colonnades and the shell of Soldier Field; the construction of the 61,500 seat state-of-the-art facility for athletic, artistic, and cultural events; an enlarged concourse, two video-boards, 8,000 club seats and 133 luxury suites; construction of a new 2,500 space underground parking structure between Soldier Field and the Field Museum utilized for general use for the public, including Museum patrons throughout the year; the construction of a two-story above-ground parking structure south of Soldier Field; the reconstruction and landscaping of a surface parking lot near McCormick Place; and the creation of 17 new acres of public park facilities. To preserve Soldier Field, the classic colonnades were saved intact as a lasting monument to its glorious past and a 250-foot granite-wall sculpture serves as a memorial to the men and women who served in the armed forces. On September 29, 2003 Soldier Field officially reopened for National Football League games with the Chicago Bears playing against the Green Bay Packers.